When I first heard about DavidsTea putting out a S’mores Chai, all I could think was the fact that I really wanted to taste some marshmallows over an open campfire (huge fan of s’mores here!) so of course I had to get my hands on some of this tea. S’mores Chai smelled delicious in the store, the dry leaf honestly smells like a s’mores with the smell of chocolate and marshmallow. I don’t really smell graham crackers, but it’s forgiven because it does remind me of s’mores. The pu’erh base gives it a nice nutty aroma. 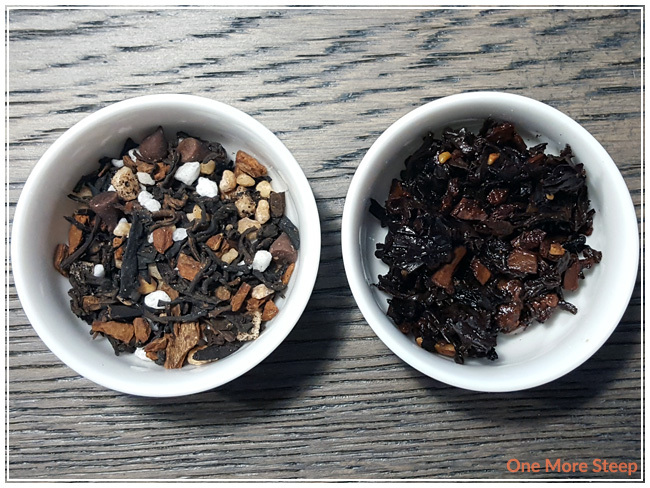 S’mores Chai consists of: pu’erh tea, brittle pieces, cinnamon, sugar, marshamllow, chocolate chips, natural and artificial flavouring. The label suggests that the tea contains hazelnuts, but where? Perhaps in one of the flavourings. 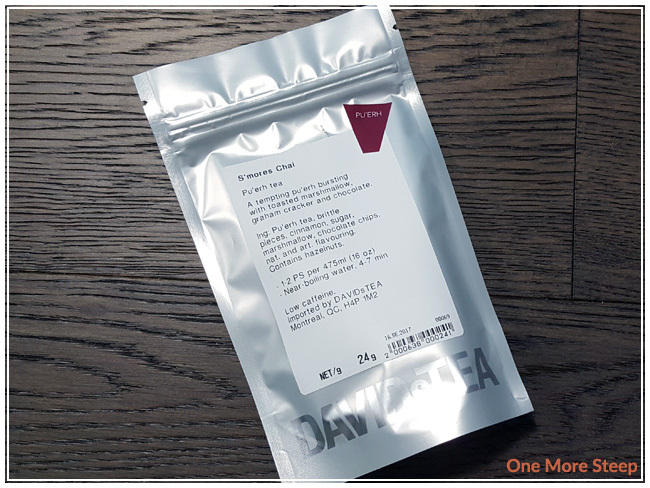 DavidsTea recommends steeping S’mores Chai in 194-203°F (90-95°C) for 4 to 7 minutes. I steeped it at 200°F (94°C) water for 5 minutes. S’mores Chai steeps to a cloudy reddish brown, with an oil slick on the top from the melted chocolate. The tea smells like s’mores, which is quite delightful. On first taste, there’s an oily mouthfeel (from the melted chocolate) and it tastes a bit chocolately with some nutty flavour. It’s a slightly watery version of hot chocolate, with the sweetness of marshmallows. I didn’t really enjoy the tea straight so I added it some sweetener, and milk to make it a latte. It’s delicious as a hot latte and would highly recommend it. 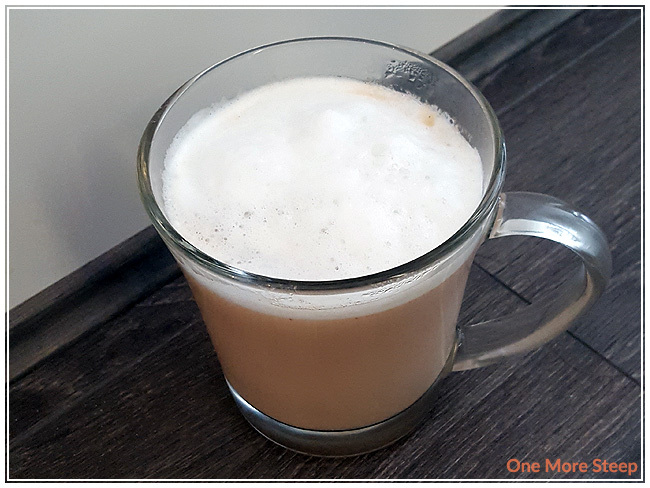 If you’re interested in learning how to make tea lattes at home without the use of a fancy machine to froth the milk, check out my tutorial on how to make lattes at home using a glass jar (and a microwave). 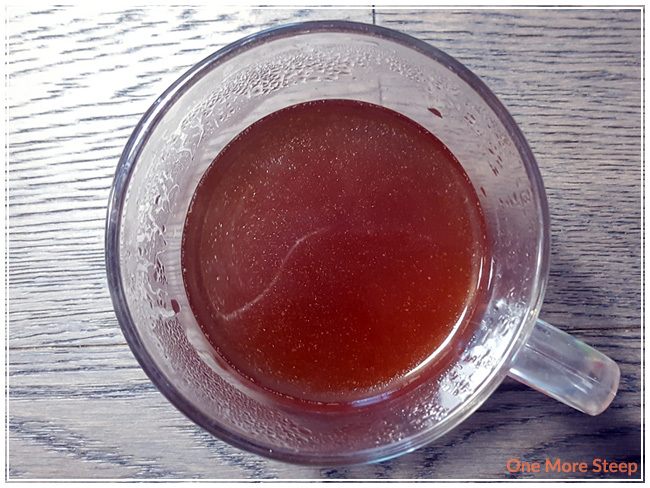 I steeped S’mores Chai a few times and found that the flavour wasn’t as rich as the initial steep. I would say that S’mores Chai is good for only one steep only. 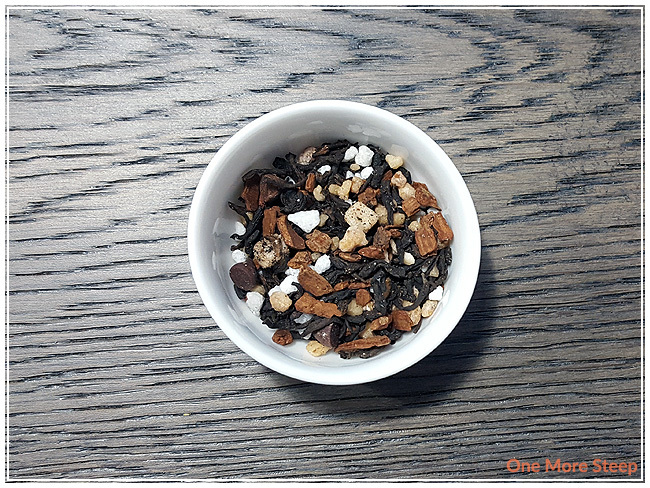 I liked DavidsTea’s S’mores Chai. I loved how this tea smell, it smells just like s’mores! This tea is excellent as a hot latte, and would highly recommend it. However, this tea didn’t taste remarkably well as a straight tea and I didn’t enjoy it. The addition of milk helps temper the oily mouthfeel that was the result of the melted chocolate chips and make the tea more enjoyable. 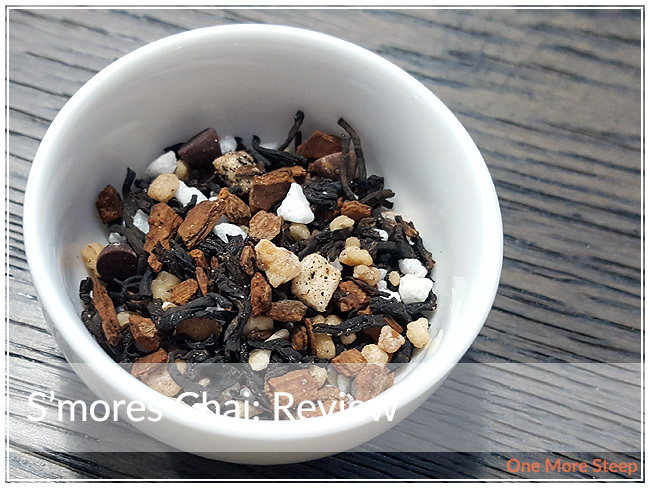 A s’mores-flavoured tea is okay in my books and I greatly enjoyed it as a treat. I think this makes a great dessert latte.